A newly detected asteroid, estimated to be about 50 meters in diameter, flew by Earth on Saturday, November 24, at around 9:40 UTC. 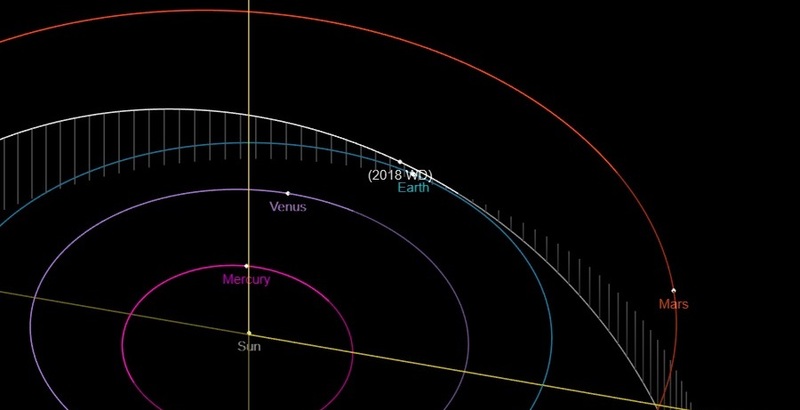 The space rock, designated 2018 WD, passed by our planet at a distance of approximately 4.5 lunar distances (LD), or 1.73 million kilometers. 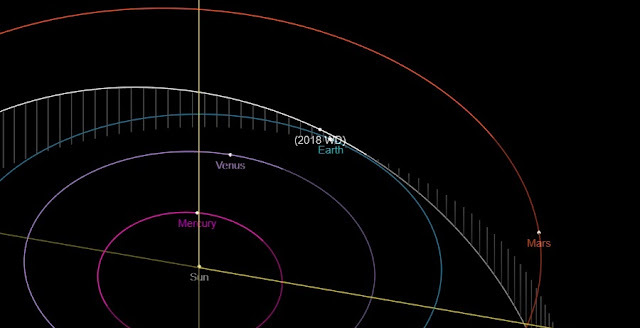 2018 WD is an Apollo-type asteroid first spotted on November 16, 2018 by the Mount Lemmon Survey (MLS), which utilizes a 1.52 m cassegrain reflector telescope at Mount Lemmon Observatory in Arizona. MLS is one of the most prolific surveys when it comes to discovering near-Earth objects (NEOs). So far, it has detected more than 50,000 minor planets. Astronomers reveal that 2018 WD has an absolute magnitude of 24.3. The asteroid has a semimajor axis of about 1.9 AU and an orbital period of approximately 2.63 years. On Saturday, this object flew by the Earth with a relative velocity of 13.6 km/s. 2018 WD also missed the moon on Saturday, at 6:23 UTC, at a distance of 3.7 LD (1.42 million kilometers). No future close approaches of this asteroid to Earth are currently predicted by astronomers. On November 25, there were nearly 2,000 Potentially Hazardous Asteroids (PHAs) detected, however none of them is on a collision course with our planet. PHAs are asteroids larger than 100 meters that can come closer to Earth than 19.5 LD (7.5 million kilometers). To date, astronomers have discovered more than 19,200 NEOs. Only in November 2018, 184 such objects were detected.